Biography: Diane Jacobson is a member of the 'Namgis First Nation. She has family ties to the Mamalilakala of Village Island, the Mowachaht of the west coast of Vancouver Island and the Kwagu'l. Diane lives in Alert Bay, British Columbia. 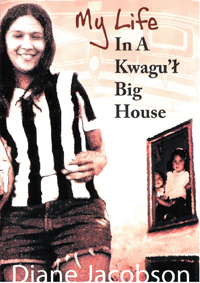 My Life in a Kwagu'l Big House is Diane's first published work and her first book with Theytus. Full of action, amazing adventures and fascinating connections between land, water and people.